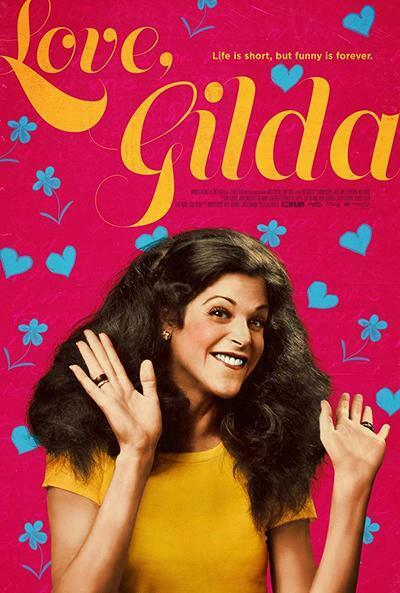 "When I look back on my life, I always felt that my comedy was to make things be all right," said Gilda Radner, the "Saturday Night Live" star whose brief, bright life is remembered in "Love, Gilda." Until ovarian cancer killed her at 42, Radner made things all right for herself and her fans. She was a true original. As a member of the first "SNL" cast in the 1970s, Radner mined her own history and psychology to create characters so memorable that their catchphrases are still repeated by generations too young to have seen them live: the blotto rock star Candy Slice, begging her hero Mick Jagger to "Rock me/and roll me/till I'm sick"; the gum-smacking tough dame Roseanne Roseannadanna, peppering her gonzo monologues with, "It's always something! If it's not one thing, it's another! "; the dotty grandma Emily Latella going on half-cocked rants about current events, only to make a sheepish, last-minute retraction after learning that she’d misheard the facts: "Never mind!" Along the way, Radner served as an inspiration to aspiring female performers who wondered whether they'd be able to carve out a space for themselves in the male-dominated world of sketch comedy. Radner was a pioneer in that respect. She showed that a skinny Jewish girl from Detroit could become one of the biggest names in late night, working alongside Jane Curtin and Laraine Newman on a variety series where men tended to claim the spotlight. In the '70s, the biggest names on "SNL" were John Belushi, Dan Aykroyd, Chevy Chase, and later, Bill Murray, who would become one of Radner's many famous boyfriends as well as one of her most exciting scene partners. Director Lisa D'Apolito's documentary is at its best detailing Radner's struggle to make her voice heard in a field that she adored, but that wasn't often hospitable to women, even when the individual men in it thought they were being gracious and inclusive. When Radner was acting in the Toronto's Second City comedy troupe with then-boyfriend Martin Short, Belushi called her up to ask her to move to New York and be part of "The National Lampoon Radio Hour" by telling her, "I want you to be the girl"—as in, we only have room for one. Radner later grew to think of Belushi as a mentor, and learned a lot from all her costars, male and female. But the snippets of audio interviews that D'Apolito works into the story underline how women in comedy back then toiled in the shadow of men, even more so than now—and how Radner had to be constantly vigilant, lest the spotlight slip away. She made a better go of it, generally, than her "SNL" costars Curtin and Newman—or Garrett Morris, the original cast's only African-American—but she later admitted frustration at how the male performers would work up routines with the show's male writers, then bring in a female cast member to play a nurse or waitress with one line. Radner compensated with tactical cleverness: because she couldn't throw out ideas as fast as the guys, she volunteered to sit at the typewriter during brainstorming sessions, realizing that if she controlled the pace at which material was transcribed and arranged, she could devise good material at her own speed and figure out where to put it. Given all the obstacles in her path, it's astonishing how fast Radner became a household name. Just five years elapsed between her first appearance on "SNL" and her first one-woman concert film ("Gilda Live," based on her Broadway hit and directed by Mike Nichols). She eventually got to the point, she said, where she would feel men's eyes looking at her on the street and wonder if they found her attractive or if they were just staring because she seemed familiar and they couldn't figure out where they knew her from. A doctor who performed medical tests on Radner wrote a fan's note at the bottom of her chart: "It was an honor analyzing your urine." Throughout her career, which continued through the '80s in movie roles opposite her second husband Gene Wilder, Radner went through the normal though maddening adult process of coming to terms with her private demons and reverberating echoes from her childhood. "Love, Gilda" is never more affecting than when it's contrasting Gilda the daddy's girl (plump and smiling in home movies and photos, constantly performing for her adoring, well-off family) and Gilda the working woman, who was profoundly self-conscious about her appearance and had an undiagnosed eating disorder that made her feel guilty whenever she ate a full meal. Radner's affinity for sweets is enshrined in one of many snippets of writing that D'Apolito showcases in close-up: "Sugar can spin into pink cotton candy/And sit on a stick like a captured cloud/Then, abracadabra!/It isn't allowed." A fragment from her adult diary sums up her struggles: "I'm a rising star with heavy chains attaching me to a hard ground." "Love, Gilda" has been put together in a fairly, typical linear way, leaning heavily on interviews (including "SNL" creator Lorne Michaels and Radner's first accompanist, Paul Shaffer) and file footage. It's such an altogether perceptive work of both biography and criticism, and so thoroughly researched, that it's a shame that its more inventive gambits don't pan out. The most striking of these is the decision to bring in subsequent comedy stars, who idolized Radner just as she'd idolized Charlie Chaplin and Lucille Ball, and ask them to read Radner's diaries and letters aloud. The footage of big names like Amy Poehler, Melissa McCarthy, Maya Rudolph, Cecily Strong and Bill Hader getting emotional over Radner, analyzing her style from a craft standpoint, and comparing her experiences to theirs are so illuminating that they feel like glimpses from an alternate version of the same movie—one that's perhaps less conventionally entertaining, but more original and surprising. The interviews with future stars become less important as the movie goes on, leaving us with a work that might feel a bit rote if Radner herself weren't every bit as charming, and ultimately moving, as her colleagues and this film say she was. Radner herself proves to be her own most astute interpreter, cutting to the chase without oversimplifying her work, or trying too hard to neaten up a messy life that she was only just starting to untangle when she died. "Because I wasn't a perfect example of my gender," she said, "I decided to be funny about what I didn't have, instead of worrying about it."